Also Recommended: Hiiro no Kakera, Story of Saiunkoku, Fruits Basket. Notes: This show is loosely connected to a series of videogames under the "Angelique" moniker, "Neo Angelique" being a renewal of the main series itself. Arcadia is under attack by the Thanatos, alien forms who attack human beings and drain them of their... life force, I guess. There's a group called "the Purifiers" that deal with the Thanatos, but they're severely understaffed. However, one of the residents of Mansion Hidamari drops by the school where Angelique attends, in hopes of prompting Angelique to awakening her hidden powers, so she may aid them in the task at hand. I wasn't sure at first whether I should undertake the review for this show, seeing as I'm about as far removed from the target audience as one can get. However, upon completion of the first season and being well underways with the second, I figured "what the hell"... I'm putting this out here right now, so that you'll take this into account when you decide whether you'll want to read my review or not. So, why, you might ask, did I decide to watch this? In no small part due to curiosity, but also because both Tim and I thought it might make for a bit of a different course for the roasting spit that the synchro sessions occasionally turn into. Does it sound like a bit of a mean-spirited reason? Sure, I'll admit that, but to tell you the truth, the show did come across for me as a bit of a companion piece to the superiorly terrible Legend of DUO, a title that brought both me and Bradley Meek much entertainment back in the day. It was an incoherent mess in the best of ways. But in the end, Neo Angelique Abyss turned out to be a bit of a different beast. I wouldn't know for sure, but the general consensus seems to be that most reverse harem shows tend to end up with bland character designs, particularly among the harem selection, and downright terrible animation. Sadly, Neo Angelique Abyss does feature some of this, though mostly in the animation department. Character designs, on the other hand, are actually fairly well done, even if they suffer a little from identical face syndrome (though not as severe as in the made up show in the comic.) Angelique herself is a particularly stylish and beautiful woman, which is particularly noticeable at the very beginning, when she still attends school alongside her significantly less attractive friends. (Which is not to say they're unsightly. Just very average.) Not that it matters, since the only characters that really matter are Angelique herself and the many recurring male characters that are involved in her life in one way or another. 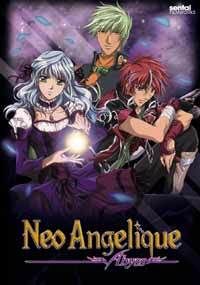 Unfortunately, when it comes to characters, story and... well, just about anything, Neo Angelique feels more halfbaked than anything else. Angelique's personality is a bit lacking, and her many somewhat bland suitors doesn't help the case either. She's a kind girl, don't get me wrong, but I don't really get her motivation when the price is basically leaving school for what is basically a really thin, fragile plot thread. See, Angelique is presumably someone known as "the Queen's Egg", and her powers are all very mystifying and arbitrary -- where the men in her life all sport various modes of physical attacks; staves, guns, whips and so forth -- Angelique herself seems to be able to will her purifying powers into effect by clasping her hands and... praying? Wishing for it? In fact, her purifying powers actually extend to the point where she can literally revive people who has been completely drained by the Thanatos, as indicated by their shrivelled-up, mummified visages. We see this happen only once, but it still makes me wonder how the Thanatos are in any way a peril. Is there a limit to how much time can pass between mummification and Angelique reviving you? How, exactly, does her powers work? And why does she seem so nonplussed when these guys literally take her out of school, almost willing to forsake her own education so that she can live with these guys in a mansion somewhere, doing nothing but being doted on by men who bake her cookies and serve her tea? And give her a cute, white cat to go with her admittedly luxurious room? If there's one misgiving I have about this show, then this would be it. Aside from its lack of establishment and explanations, it's a bit of an entitled angle; kind of like the gender-reversed version of harems for males, where the women flock around the nondescript guy for seemingly no other reason than because he's a nice guy. Or, as is the case here, because Angelique is a sweet girl, which she is. She's just not a very interesting one. It also doesn't help that the Thanatos themselves seem to take a bit of a back seat in the first season as dangerous perils go. Sure, they can drain people up to the point of literally mummifying them, but there's no sense of peril even then. Angelique and her friends doesn't really fight Thanatos all that often, and when they do, Angelique dismisses them with anti-climactic ease. Further hurting this cause is the downright goofy designs of the Thanatos themselves, most of them looking like cases of "my first 3D CG designs in art school"; lots of orbs, soft spikes and tentacles, but no features that will remind you of anything in particular, and this is where the terrible animation hurts the show the most; barely any of the Thanatos move, and in the more surreal parts of the show, people get drained by the Thanatos because they almost physically approach one of them, even though they know very well how dangerous the Thanatos are. Or so we are told anyway. Good thing, then, that the show is also goddamned hilarious. Between the goofy design of the Thanatos, the arbitrary ways Angelique and her crew travels around or the ease of which a bunch of apron-wearing, cookie-baking hunks whisk her away to a luxurious mansion; Neo Angelique Abyss has a certain charm to it. When the team isn't spending some quality time at Mansion Hidamari, the show seems to adapt a certain "go there, do that" pattern that is usually solved in a single episode, the lone exception being the final two, which bridges the two seasons with a mood swing that'll break your neck if you're not careful. Honestly, I'm not sure what amuses me the most; the rampant abuse of speed lines and single cels during battles, the goofy dialogue, the ludicrous adoration every single male who meets Angelique feel for her almost immediately or the corny plot elements that pop up from time to time. I think the highlight of the first season was when Angelique and her friends went to the capital to visit the head of the order, and this effeminate guy named René brings Angelique on a tour/mad chase around town to avoid a reporter, whom they dodge by holding up and standing behind a piece of sheet with a brick wall pattern on it, and I can't stress enough just how many ways that does not make any sense. Seriously, you have to see this. It just defies any head shaking and disbelieving laughter you can come up with. As you can probably tell, I had a great time watching Neo Angelique Abyss. It might be mean of me to say this, but the unintentional hilarity this show provides easily make up for its weaknesses. And yes, it's also a well-meaning show, so I do feel a little bit bad for poking so much fun at it, but that's just to be expected when you move into harem territory. It's certainly better than being tedious as sin, which I'm sure Melissa would agree with me. And, of course, if you're a girl looking for some reverse harem action and you're not too picky with the story, then what are you waiting for? Recommended Audience: While the mummification resulting from Thanatos attacks shouldn't be anything to sneeze at, the show is simply too goofy to be scary. The closest this show gets to serious is the somewhat abrupt mood shift at the end. As it is, the general violence and the light sexual talk in one episode is a solid indication that the show was intended for teenagers. Neo Angelique Abyss © 2008 KOEI, Yumeta Company, Neo Angelique Production.